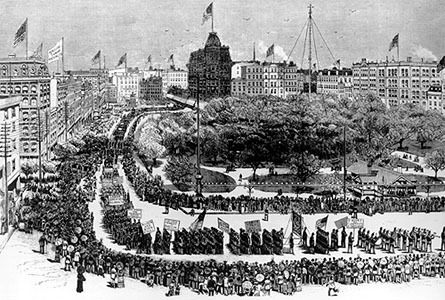 Over 30,000 workers march in Union Square in what would become known as the first Labor Day parade. After a decade of oppressive economic and social conditions, New York City's newly formed Central Labor Union called for a public showing of labor's strength. Members of the Knights of Labor and craft unions marched with signs demanding an eight-hour workday; an end to child labor; equal pay for equal work; and urging people to "Agitate, Educate, Organize." In 1998 the National Park Service designated Union Square a national historical landmark as the site of the first Labor Day observance, as well as a place where workers exercised their rights of free speech and assembly through many years of May Day parades, unemployed demonstrations, and protest rallies. This image is featured in one of the bronze historical plaques installed in Union Square to commemorate the history of labor in the square, and is the title image on the LaborArts exhibit on Union Square. Image from Frank Leslies' Illustrated, Robert F. Wagner Labor Archives, New York University.